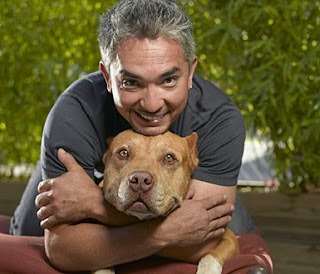 Choice and Truth: Learning from "The Dog Whisperer"
Learning from "The Dog Whisperer"
For those of you who don't know "The Dog Whisperer" allow me to introduce you to Cesar Milan. Cesar has risen to fame because of his uncanny ability to take "bad" dogs and turn them into good ones. So what is Cesars secret then? Why can he turn around dogs that most "experts" would banish to the pound? The answer is quite simple, energy. In his own words Cesar says that "a dogs goal is to be connected, to live harmoniously, grounded, and balanced, in tune with Mother Nature". When "The Dog Whisperer" arrives at the residency of his clients he observes their energy and how they interact with their dogs. What he always comes to find is it is the owners themselves who are the source of the dogs bad behavior. This is a result of the unbalanced energy of the owner which in time translates to their pets. At first most of his clients are in denial because their limited perspective and "ego" had made shore they were not to blame. This unfortunately is a common outlook amongst many, if not most of us, "Everyone and everything is to blame, except me". Once ignorance and arrogance finally give way to humility and rationality, the owners accept the truth and then begin to take the necessary steps to change their behavior so that it is aligned with Mother Nature. Rehabilitating the dogs depends on how much learnt misinformation, bad guidance and traumatic experiences (for the dogs who have been victims of some form of abuse) have penetrated their natural state of being. On certain occasions when a dog is proving to be extremely difficult, Cesar will take the unbalanced animal to his dog center in California where he has a collection of over 50 dogs (just about any breed you can think of) who have all been rehabilitated to their natural way of being and therefore form a collective well balanced energy. In time, depending on how badly the poor animal has been brainwashed, the dog will eventually recollect its true nature and then begin to live in harmony with the other dogs at the center, regardless of breed, and in harmony with itself and Mother Nature. Does this sound familiar at all? Well it most certainly should. We too have been fed misinformation and even worse, disinformation from our so called leaders since our youth. It is no wonder why there is so much confusion and unhappiness in the world when those who we look to for guidance are either ignorant, manipulative, or both! As "The Dog Whisperer" said, "humans are the only species on earth that will follow a totally unbalanced, unstable leader". Just as a dog is a product of its owners energy, so too is society a product of the energy fed to us from our "leaders" through the media, religious, school, government, and other systems. Rather disturbing when you think of how negative and fear provoking the news is or how distorted religions are claiming their way is the right way and to deny it is to deny God? Hmmm I smell more fear and less critical thinking because a scared mind is a paralyzed one. Lets not even get started on the government system because that's already old news and the school system is the system to help sustain the others and our flawed and unbalanced way of life. As Jiddu Krishnamurti once said "It is no measure of health to be well adjusted to a profoundly sick society". We, my friends are not living in accordance with The Universe and this is why we experience so much pain and negative energy within. There is hope however, there are leaders we can turn to, ones in fact that we are some what familiar with, people like Eckhart Tolle, Gandhi, Wayne Dyer, Martin Luther King Jr., Mother Teresa, Deepak Chopra and many others. These leaders can be found in books and the Internet amongst other places and we should familiarize ourselves with their teachings. Ultimately we must accept the role of both pet (student) and owner (teacher). As a student we should seek for stable, well balanced leaders, information and friends. We do this by what appeals to our reason and energy within. As a teacher we should take full responsibility of our lives, of our happiness and not blame everyone and everything else for our inner turmoil. Instead let us accept we are some how not in accordance with Mother Nature and then self reflect with humility and rationality. Our natural way of being is that of a baby, no prejudices, no fixed belief system, just beautiful imagination, pure joy and amazement with the miracle of life and an open mind that is fully engaged in the present moment. Just as the countless dogs, regardless of the sometimes horrific and unethical abuse suffered mentally and physically have been rehabilitated, so too can we return to our true nature and live in harmony with our fellow beings, ourselves and our Universe/Mother Nature. "Dedicated to empowering the people"